Whether you are an athlete, a bodybuilder or just strive to look better you must have faced the challenge of losing weight. Zumub’s L-Carnitine 4000 vials can simplify this process. Some sources refer to it as an amino-acid but the truth is L-Carnitine is synthesised from two amino-acids - lysine and methionine. Natural L-Carnitine sources include red meat and milk but relying on a supplement is an easier and quick way to add more carnitine to your diet. It carries fatty acids to where it undergoes oxidation - gets converted into energy. Where’s magic? Fat does you good and doesn’t store to skyrocket the scales number. So, it will reduce fat accumulation and it will allow you to have more energy to workout and to achieve the body you desire, especially if its intake is part of a balanced diet and a proper exercise plan. How Is Zumub’s L-Carnitine 4000 Different? Zumub’s L-Carnitine vials are convenient to take - just one vial a day and no complications. Their fresh flavour will add to the pleasant emotions of the day. Plus, it will ensure you the best quality at a very competitive price. Tired of fighting excessive weight all on your own? Let Zumub L-Carnitine 4000 give you a helping hand. 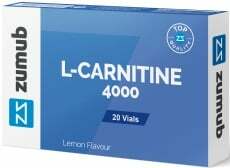 WARNINGS L-Carnitine 4000 : Do not exceed recommended dosage. Keep out of reach of children. The product should not be used in case of hypersensitivity or allergy to any of the ingredients of the formulation. Contain sweeteners. Food supplements should not be used as a substitute for a varied and balanced diet and healthy lifestyle. BEST BEFORE: Please see lot number and expiration date stamped on the packaging. Store in a cool, dry place. Please Recycle.